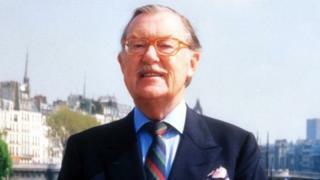 Money left in the will of broadcaster Alan Whicker will be used to boost documentary-making in the UK, his estate has announced. Three prizes totalling £100,000 will be awarded to new film-makers, including one to encourage people aged over 50 to film their first documentary. Whicker, who died in July 2013 aged 87, travelled the globe for more than 50 years making TV programmes. He was best known for presenting Whicker's World from 1959 to 1988. The launch of the awards, aimed at supporting authored documentary storytelling in the UK, was announced at the Sheffield Documentary Festival. As well as encouraging older documentarians, there will also be a prize for the best debut film-maker under the age of 30. After joining BBC television in 1957, Whicker worked on the Tonight programme which saw him presenting a whole series of offbeat reports from a wide variety of places and countries. Two years later he started presenting Whicker's World which ran for 30 years, first on the BBC and then ITV. The programme saw him crossing continents covering a bewildering variety of topics. Peter Sellers, Joan Collins, writer Harold Robbins and the Sultan of Brunei were among his famous interviewees along with the notorious Haitian dictator "Papa Doc" Duvalier. The first winners of the Whicker's World Foundation awards will be announced on the final day of next year's Sheffield Doc Fest.